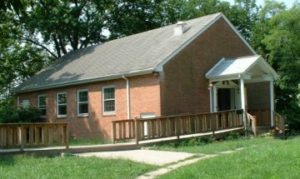 Located a few miles north of Washington, D.C., the meetinghouse is between Riggs and Adelphi Roads, near the University of Maryland. From Maryland Route 650 (New Hampshire Ave), go east on Metzerott Rd. The meetinghouse is on the right, one block past the (first) traffic signal at Riggs. We are 1½ miles from the University of Maryland University College on Campus Drive. This route has sidewalks except for the last block before the Meeting House. We are located one mile from the Northwest Branch Trail. Ride north on Riggs Rd (which has limited shoulders). Turn right on Metzerott Rd and travel one block. Our meetinghouse will be on the right, at 2303 Metzerott Rd. Ride through the park to Stanford St. Turn left and ride north on Adelphi Rd (which is well-rated for on-street cycling). Turn left from Adelphi Rd onto Metzerott Rd and travel one block. Our meetinghouse will be on the left, at 2303 Metzerott Rd.